Labour exploitation in Australia is a massive problem and becoming worse. And it's not like our parliamentarians are unaware of the facts. In March a senate report, titled 'A National Disgrace: Exploitation of Working Visa Holders', provided evidence of significant exploitation of vulnerable workers and made 33 recommendations to address these issues and work towards change. Yet, not one of these recommendations has been taken up and there is no sign yet that they will be. When the skip arrived and a young bloke named Troy backed it into our driveway with insolent ease, I knew the game was up. Months of sporadic, amiable discussions had now reached a suddenly irrevocable conclusion. Our agenda - what to do with 'hoarded' papers and notes, drawers of never-to-be-worn-again clothes, children's picture books and abandoned Lego, decades old back copies of magazines - was called to order by a higher power and my filibustering and equivocations abruptly ended. Australia is now planning for an economy that has more elderly people. Death rates are declining and life expectancy is increasing. Our population should reach 36 to 40 million by 2050; the number of Australians aged 65 and over will go from 3.5 million to 9 million. In 1970 we had 29 per cent of the population under 15 and 8 per cent over 65. In 2050 we will have about 17 per cent under 15 and 23 per cent over 65. We need to plan to help the next generation care for the generation above them. 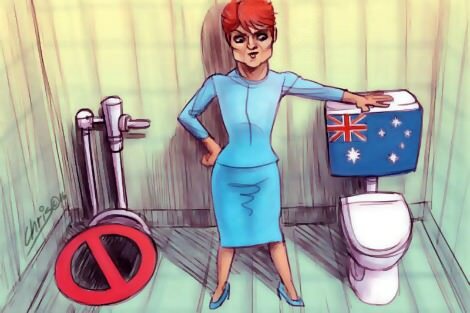 It is ironic that Hanson thrives on the perception that she is an authentic outsider against 'the system' when in fact she is part of that system. Think about how she is constantly given paid platforms by television networks. She hasn't been silenced by 'the system', her voice is heard and has been amplified. She is also no amateur, she is a professional and knows exactly what she is doing. She is not some 'battler' being picked on, and that needs to be emphasised. According to the New York Times, historical documents show that in the 1960s the sugar industry paid scientists to downplay the link between heart disease and sugar consumption, and to pin the blame on saturated fat instead. The consequences of this unethical behaviour are scandalous: five decades of nutrition research tainted by the sugar industry's interference. I'd already reached my own conclusion about the dangers of sugar when my then-17-year-old son was diagnosed with type 1 diabetes. On 15 January 2009, US Airways pilot Chesley 'Sully' Sullenberger successfully executed an emergency water landing on the Hudson River in New York, after both engines on the passenger jet he was flying were disabled following a collision with a flock of geese shortly after takeoff. Miraculously, and thanks largely to the veteran pilot's razor instincts and resourcefulness, all 155 passengers and crew on board escaped the ordeal all but unscathed. In Sully the incident itself is portrayed in near forensic detail (aviophobics might best stay away). But it is the human touches that really make it soar. I don't speak Spanish but I knew I had to try to ask someone. It wasn't an appealing idea. The crowds of people roaming here were the bereaved. They were here to visit their loved ones, not help me tick a box on my tourist adventure. However, I had little choice. I stopped a friendly looking middle aged man. 'Victor Jara,' I said. 'Donde?' He smiled and said a lot of things in Spanish while gesturing in a particular direction. I thanked him and headed the way he had pointed. One time when I was about 12 my friends and I found a smouldering fire in the little woods behind our town's fire station. So we pulled it apart, and stomped it out, and threw dirt over the embers, and cleared brush away from the site, and then, dusty and sooty and inordinately proud of ourselves, we trooped into the fire station to report our feat. The fireman who met us listened carefully, and then he told us grimly that if ever we did such a thing again he would report us to the police.